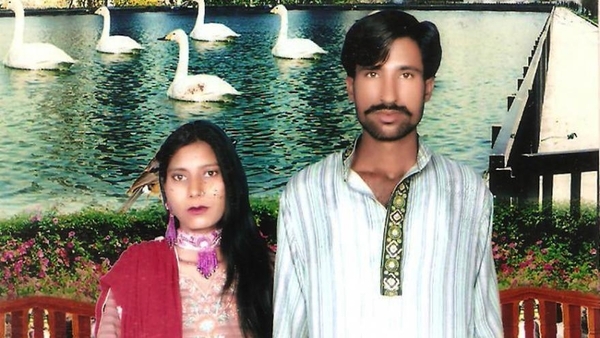 (Photo: Courtesy Gatestone Institute)Shama Bibi (left) and Shahzad Masih, a Christian couple and parents of three children, were burned to death by a Muslim lynch mob in Pakistan because of a blasphemy accusation. An Algerian court has sentenced a Christian man in Algeria to five years in prison, the maximum term, and dealt him a heavy fine for blasphemy against Islam and its prophet, for a social media post. Slimane Bouhafs, 49, was arrested on July 31 for posting a message on social media about the light of Jesus overcoming the "lie" of Islam and the Prophet Muhammad, Evangelical Focus reports. He also published photos showing the execution of a civilian by an Islamist terrorist. Such material is judged by the authorities to insult Islam, the state religion in Algeria, according to its Constitution. The penal code provides for a penalty of three to five years in prison, along with a heavy fine, against anyone convicted of insulting Islam and Muhammad, its prophet, World Watch Monitor reports. The Algerian Constitution deems that such material insults Islam, the State religion. The country's penal code provides for a penalty of three to five years in prison, along with a heavy fine, against anyone convicted of insulting Islam and Muhammad. However, the vice-president of the Algerian League for the Defense of Human Rights (LADDH), Said Salhi, denounced what he called "this attack" on the guarantees of freedom of conscience and worship enshrined in Algeria's Constitution. The human rights group said it wished to "alert public opinion and defenders of liberties to this new attack against the rights guaranteed by national laws and the international instruments of human rights." LADDH also called for Bouhafs' unconditional release and for "a broad mobilization to push back an unlawful act, to let justice triumph." Bouhafs' sentence shocked his family, who denounced what they called a "sham" trial of the man who became a Christian in 1997, and who was baptized in 2006. His daughter, Afaf, said her father is man who has always defended the interests of his country from a young age and he is known for his commitment to democracy and religious freedom in all his writings published on his Facebook page. Bouhafs' family expressed deep concern, as he suffers from a chronic illness and his health may deteriorate as he goes to prison.